The Gujarat government has declined sanction to prosecute retired police officers D G Vanzara and N K Amin in the alleged fake encounter case of Ishrat Jahan and three others. A CBI court had earlier rejected discharge applications of the two former officers. The Gujarat government has declined sanction to prosecute retired police officers D G Vanzara and N K Amin in the alleged fake encounter case of Ishrat Jahan and three others, the Central Bureau of Investigation told a special CBI court on Tuesday. After going through a letter submitted to the court by CBI lawyer R C Kodekar to special CBI judge J K Pandya said the sanction to prosecute the former officers, who were accused in the case, under section 197 of the CrPC, was declined by the state government. The decision may pave the way for the controversial case against Vanzara and Amin to be dropped. Defence lawyer V D Gajjar had then sought permission for filing an application to drop proceedings against the two former police officers. Granting the request, the court has asked them to file an application on March 26. The reasons cited by the Gujarat government for denying the permissions are not known. “We had received the sealed cover, which was submitted to the court. The court has told that in the letter the government has declined the permission,’’ Kodekar said. The court had earlier rejected discharge applications of the two former officers. The CBI had sought the prosecution permission after the court had asked it to clear its stand on whether it wants to get sanction to prosecute them from the state government. Vanzara and Amin are two of the seven accused chargesheeted by the CBI in the case. Vanzara is a former deputy inspector general of police, while Amin retired as superintendent of police. IPS officer G K Singhal and retired deputy superintendent of police Tarun Barot were other main accused in the case. Former Director General of Police P P Pandey was discharged by the court in the same case. 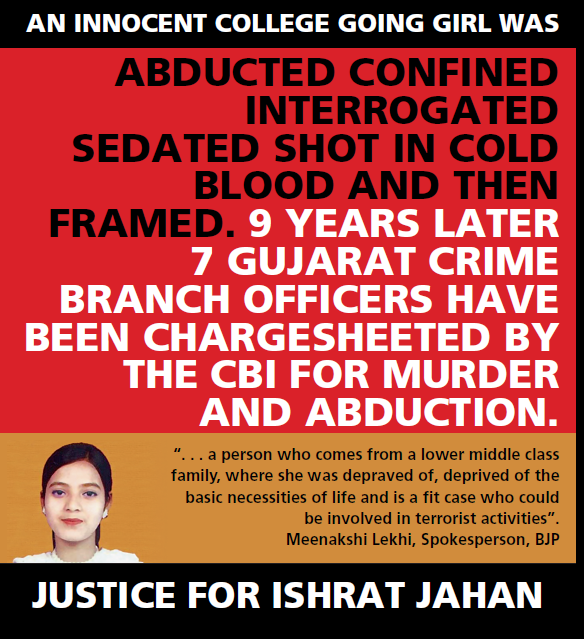 Ishrat Jahan, a 19-year-old college student from Mumbra near Mumbai, Javed Shaikh alias Pranesh Pillai, Amjadali Akbarali Rana, and Zeeshan Johar were killed in an alleged fake encounter by the police on the outskirts of Ahmedabad on June 15, 2004. The Gujarat police had claimed that the four had links with terrorists and had plotted to kill the then Gujarat chief minister Narendra Modi. Shammima Kausar, Ishrat’s mother, had filed a complaint that her daughter and others were abducted by the Gujarat police prior to the encounter.